LAUREL, MD. 02-15-12---Trainer Michael Hushion has won two of the previous four Barbara Fritchie Handicaps, winning with Golden Dawn (2008) and Harissa (2011). This Saturday, the Belmont Park-based conditioner is sending graded stakes winners Nicole H and Lovely Lil south in search of another Grade 2 score. The storied $200,000 Fritchie kicks off holiday racing this weekend at Laurel Park. 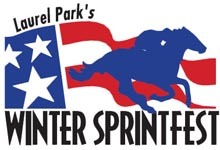 The John B. Campbell Handicap is the co-feature on Saturday with the $200,000 General George Handicap (G2) headlining Monday’s President’s day card. The 58th edition of the Fritchie has attracted nine fillies and mares, who will race seven furlongs. Nicole H has been tabbed the 6-5 morning line favorite by Maryland Jockey Club handicapper Frank Carulli. The daughter of Mr. Greeley has finished first or second in eight of her last nine races, including five stakes victories. Nicole H, who won the Grade 2 Distaff Handicap at Aqueduct last April, was victorious in the Correction Stakes on February 4. Ramon Dominguez, who rode Harissa to victory last year, has the mount on Nicole H for the seventh time. The two have teamed up for five victories. Saturday will be a homecoming for the 35-year-old rider who called Maryland home from 2000-04 when he won 1,012 races at Laurel Park and Pimlico Race Course. Dominguez relocated to New York in 2009 after dominating the Delaware Park colony in the mid-2000’s and was named Eclipse Award winner for outstanding rider the last two years. Lovely Lil (6-1) won three of five races in 2011, including the Grade 2 Go for Wand Handicap in late November. The daughter of Tiznow finished second in her 5-year-old debut in the We’ll Sea Ya Stakes at Aqueduct on January 13. Julian Pimentel will ride. Rick Dutrow, who won the 2005 and 2007 Fritchie’s with Cativa and Oprah Winney, will ship C C’s Pal (7-2) down to central Maryland from his Aqueduct base. The daughter of Alex’s Pal has won three of four since arriving in Dutrow’s barn, including the Ladies Handicap at the Big A on New Year’s day. Junior Alvarado will ride the 5-year-old mare. 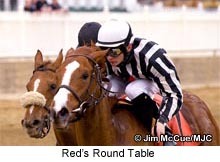 Red’s Round Table (5-1) improved to eight-of-10 lifetime and four-of-five at Laurel with a powerful allowance score on January 21. The 4 year-old daughter of Cuvee cracked an ankle after winning the Wide Country Stakes here last March but has won two of three since returning. Sheldon Russell has the riding assignment on trainer Tim Keefe’s star. Aquitania (6-1) reeled off four straight wins at Laurel during the 2011 fall meeting, including one over Red’s Round Table and 2011 Fritchie runner-up Aspenglow on December 1, then finished third behind Nicole H in the Interborough Stakes on New Year’s Day. Pimentel is named to ride the daughter of Leroidesanimaux for trainer Hamilton Smith. Magical Feeling (10-1) has won 10 of her last 13 starts for trainer Allen Iwinski but was a distant third behind Red’s Round Table here last month. Regular rider Roberto Alvarado will accompany the daughter of Empire Maker from Parx Racing. Gary Capuano finished second in last year’s Fritchie with Aspenglow. This year he’ll saddle multiple stakes winner Silver Heart (15-1), who has finished on the board in 22 of 29 lifetime starts. The 7-year-old daughter of Lion Hearted won the 2010 Maryland Million Distaff Starter Handicap. Travis Dunkelberger, who won the 2001 Fritchie with Prized Stamp for Gary’s brother Dale, has the mount. Terra Rolla (30-1) and Lily Quatorze (30-1) round out the field.